Oh, 241 tote – you temptress. 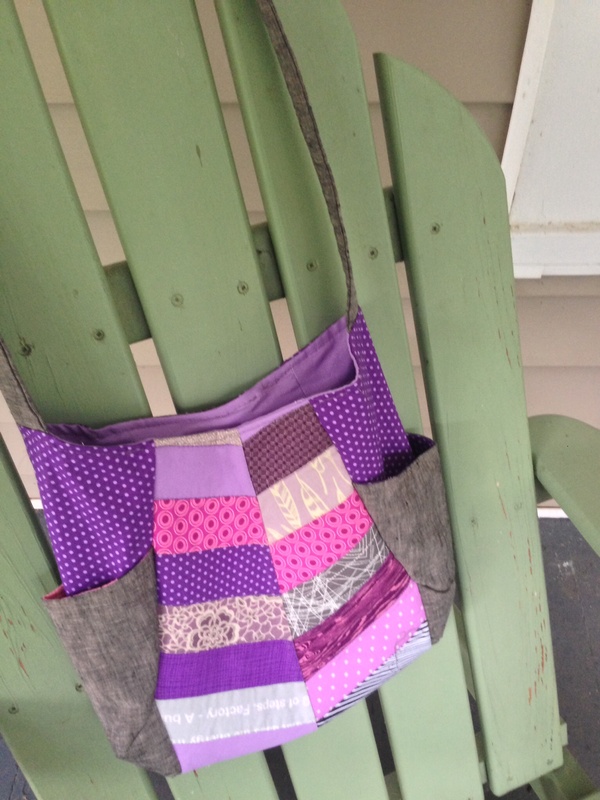 When I first saw the swoon block, a drum beat started in my head that I *had* to make it. 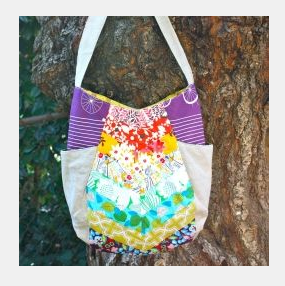 The same drum beat started when I first saw a picture of the 241 tote – not so much that I wanted to make it, but I wanted to own it. I knew that my bag making skills would be total crap. So I admired 241s from afar. Beautiful, but beyond my brief. And then Rita. Oh, Rita. Her photographs, her designs, her choice of fabric. I would definitely jump off a bridge if Rita told me to. 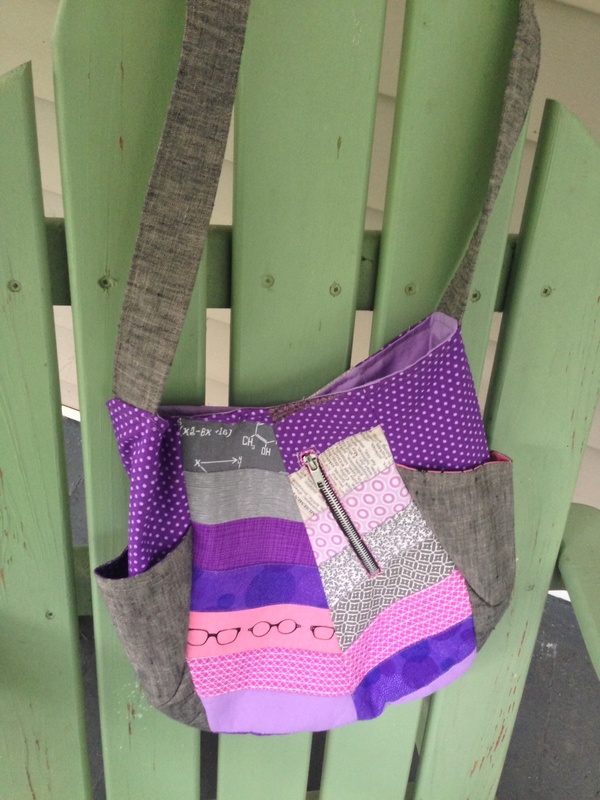 She made some 241 totes and I swooned. And so I bought the pattern, secured a time when my mom could help me, and started praying to the bag gods (Hermes?). When it came to the fabric I wanted to use, that was a whole new challenge. My personal home decorating quilt style is bright, bold. If I was single, my house would be decorated in the tones of unicorn vomit and all the quilts I would make would be PINK! PINK! PINK! I am allowed full crazy reign over our bedroom, and limited crazy reign over in almost every other room. There is a lot of color in our house. My personal wardrobe is completely different. In a style forged in the fire of obesity, unkind comments, personal lack of confidence, whacking hormones, and hating discomfort, I have a wardrobe that is almost solely dark colors and soft, thin fabrics. In over 30+ years of dressing rooms and fashion misery, I know what I like. It may not be what other people may like, and they most likely wish for me an injection of color and skirts. But those people don’t have to live in my brain, and my skin, and my clothes. I do. I know what makes me happy and I know what makes me uncomfortable. And so the answer is this dark storm. 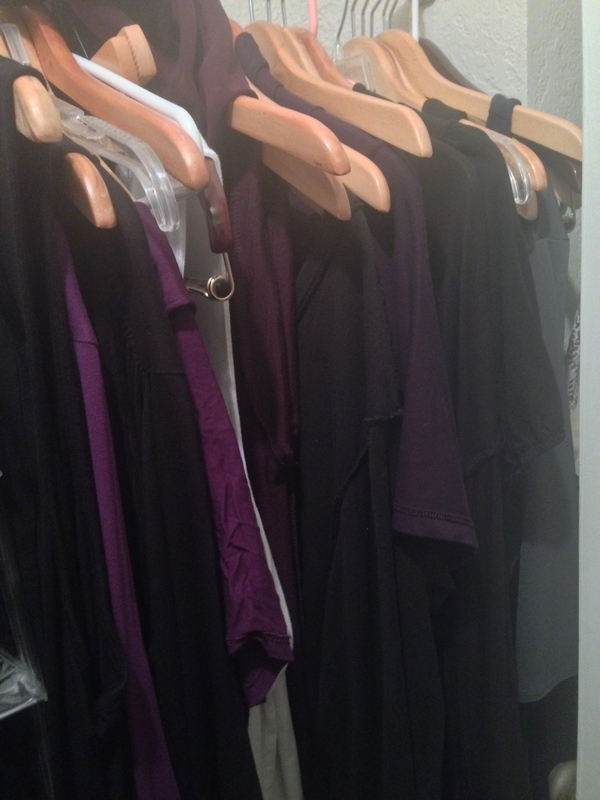 Grey, black, purple, and black. And grey. And purple. So when I started thinking about my 241 tote, I really wanted to use the navy arrows fabric from Cotton and Steel. But then I wouldn’t have anything to carry it with. And so I decided on purple and grey. It definitely is on the bold side of my personal style. I think I love it – but I also think it may be too cutesy. 1. I sort of ignored the fabric suggestions. I didn’t have easy access to pretty canvas or home dec fabric – so used linen and quilting cotton for everything. I think it will be ok. I followed the tutorial roughly to create the braid pattern and added fusible fleece and did some in-the-ditch quilting. Fusible fleece helped stabilize the panel, but it is so yucky feeling. But not a problem now that it is on the inside of the bag. 3. I made pockets! And made as much scrappy as I could. 4. 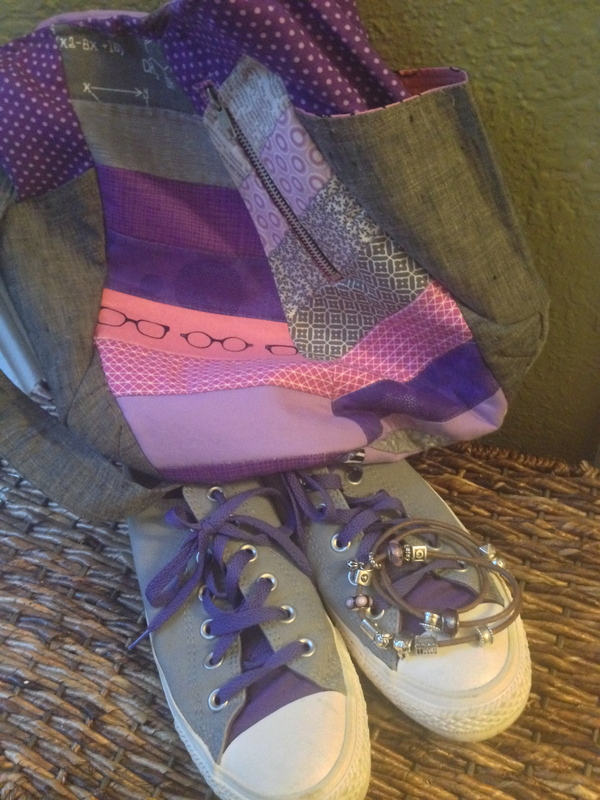 Purple is a funny color – it can be brown, pink, grey, blue. I decided to just go for it and use all the purples. And most of the greys. I think it works. And looks awesome with my custom chucks and charm bracelet. 5. This was a giant challenge for me. Having very limited experience making anything but quilts, I learned a lot. And had help from my mom. There are some flaws, but all that I can live with. 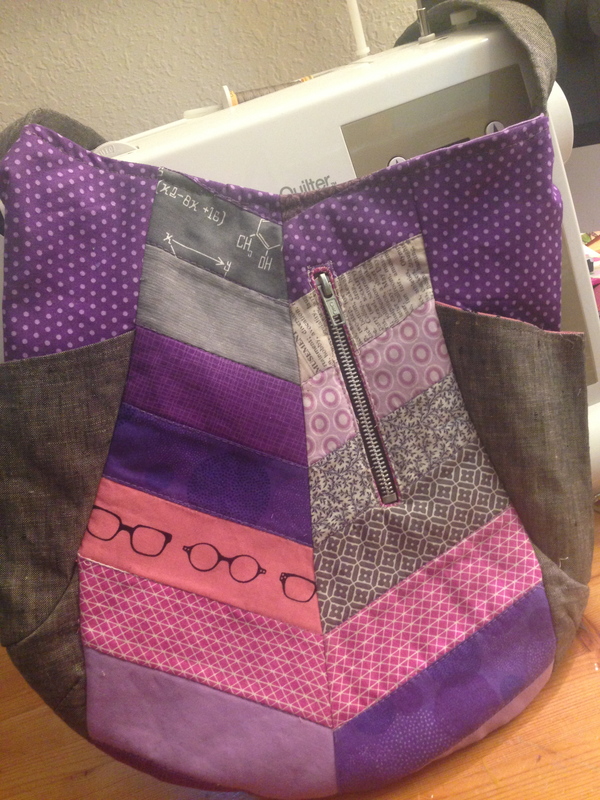 I sewed in the zipper three separate times before I knew I could live with it. My lifesavers on this project: glue basting and a walking foot. And letting go of the need to be perfect and have everything come easily to me. hashtag life lesson. Thank you for reading my 241 reveal / rant! I still have an itch to make one with the cotton + steel arrows. Maybe I’ll make it and go crazy and buy a couple dark blue t-shirts. Crazy, I know.